The Chinese Engineering & Mining Company Limited was established in 1900 to mine coal for steamships in the area around Tientsin, China. The company was reformed in 1912 as a public company registered in London. 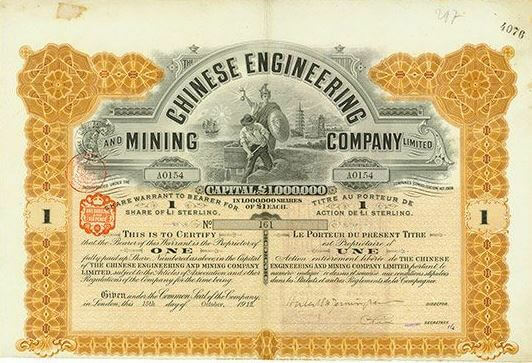 Also in 1912 the Chinese Engineering and Mining Company and the Lanchow Mining Company Limited formed the Kailan Mining Administration to administer the coal mines. In the 1920s the Company was producing c4.5 million tons of coal annually, some of which was exported to Hong Kong, Japan and other places in the Far East. All its activities ceased in 1949 with the Chinese Civil War, and the subsequent Communist takeover. The company was finally dissolved in 1984. AIM25 is a permanent web-accessible database of descriptions of the archives and manuscript collections of more than one hundred and fifty of London’s higher education institutions, learned societies, cultural organisations and City livery companies.